The Moon is the symbol of romance, cycles, and wonder. As a cycle card, the Moon waxes and wanes, changing the tides in the oceans and subtly influencing our perceptions and emotions. The Moon connects us to humanity as she appears to all people in the sky. When the Moon is dark, we plant the seeds for new beginnings; in her full luminosity, we celebrate the energy of creation. In the dark of night, the moon lights our way, intuitively enlightening us from beyond the physical realm. The Moon represents the intuitive force that reveals and illuminates that which is hidden. The Moon can promote fear and anxiety as it moves to the dark and then phases to light. 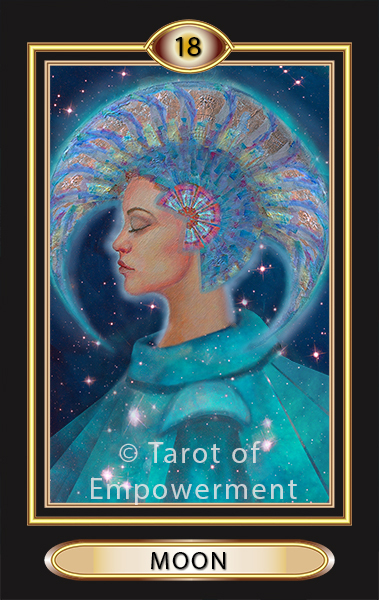 In Tarot of Empowerment, the Moon floats through the sky as the gentle breeze fills her cloak. The cloak adds a glow to the darkness in the sky, embracing the power and mystery of the night. The Moon is tender and serene as she contemplates her place in the sky and listens to the secrets held by the constellations. Upright: When the Moon comes up for you in a reading, be aware of the difference between illusions and reality and pay attention to the internal tides of your dreams and feelings. Take time to contemplate, listen carefully, and look for the light from within to reveal the truth of the matter. Learn to trust your intuition. Empowerment: You are empowered by the Moon when you are able to call upon your intuition to help you distinguish between illusion and reality. Reversed: In a reversed position, the Moon suggests you not listening to your intuition and are under the spell of an illusion. When the Moon indicates a block, it means that you are letting your fears get in the way of seeing the truth. Numerology: The Moon is assigned the number 18, which reduces to 9. Nine is about completion and selflessness. The other card that is a 9 is Introspection.